Jersey Sport is today publishing its annual report, summarising its first full calendar year of existence and highlighting the varied and far-reaching work of the organisation. The report shows nearly 1,000 children were signed up to Jersey Sport activities during 2018, with hundreds more attending the Playday event in Parade Gardens. In schools, nearly 4,000 P.E. lessons were taught by Jersey Sport staff, while 688 swimming lessons were delivered during term time. 863 children with Special Educational Needs (SEN) were helped to get active. Meanwhile, more than 100 people took part in the Appleby Active Adults programme activities, including walking football and Monday Movement sessions. 80 different medical conditions were supported by the Active Referral scheme, following referrals by healthcare professionals. Around 3,000 journeys were backed by Travel Grants during 2018, with Jersey Sport distributing the States funding to 32 different sports. There were more than 150,000 page views of the Jersey Sport website. “This report shows without doubt both the benefits of having a ‘champion’ for sport outside of Government and the opportunities that can be realised,” said Senator Steve Pallett, Assistant Minister for Economic Development, Tourism, Sport and Culture. 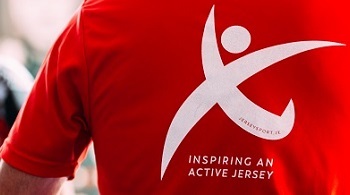 Jersey Sport is required to publish an annual summary of its activities as part of its funding agreement with the States of Jersey, as an arm’s length independent organisation. “We’re really proud of the impact we’ve already made in the island, working with numerous partners, supporters and volunteers,” added Jersey Sport board member Tony Taylor. “We’re grateful for the States grant we receive for the service delivery part of our remit and we’ve laid a solid foundation ahead of the draft ‘Inspiring an Active Jersey’ strategy. To read the annual report, CLICK HERE!